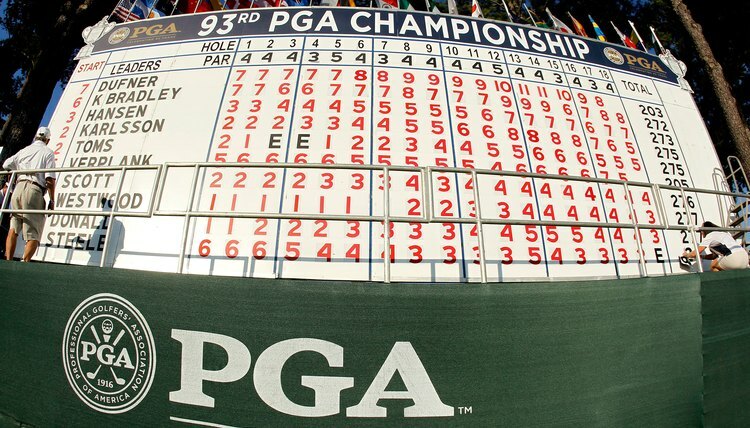 The leaderboard is golf's version of a scoreboard which is updated regularly during tournaments. The leaderboard in a golf tournament is a large vertical structure that displays the relative standing of players with the best scores--often the top 10. Scores are expressed relative to par, such as 10 under. Unlike football, where the spectators view all the action and can keep track of the score without the benefit of a scoreboard, in golf, the action takes place at 18 different locations--each hole on the course. Spectators need to know who is leading, and see when the leader changes, in order to get the most excitement out of watching a tournament. In the early days of professional golf, the 1920s to 1930s, the system for collecting and displaying scores was rudimentary. After play on a hole was concluded, the scores were taken manually to the 18th hole for posting. Players in contention did not necessarily know how they stood relative to their competitors playing on other holes, nor did spectators. Gradually, advances in technology allowed leaderboards to be updated more quickly. At the Masters Tournament, an underground network of telephone cables was installed in 1941 to quickly transmit scores to the leaderboard operators. By 1955, this system was in place on every hole. At most tournaments, there is a large leaderboard near the 18th hole so spectators have easy access. This scoreboard has large numbers that are visible over a wide area. "Field leaderboards" are also placed at various locations around the course--at the Masters, they were first installed in 1947, and the innovation greatly improved the ability of spectators to stay updated. No longer did they need to wait until they reached the ninth or 18th holes--the holes closest to the main leaderboard--to get an update. Leaderboards were formerly updated manually. The scores would be phoned in or manually carried to the leaderboard operator, who updated the board by displaying cards with the correct numbers for each player’s current standing. Today, leaderboards are often electronic displays networked from a central scoring center, and the scores are posted more quickly and accurately. Golf fans now have real time access to the leaderboards in every official tournament around the world through the Internet. Websites such as pgatour.com and golf.com feature live leaderboards that show not only the current position of every player but complete scorecards for each. Key statistics such as the percentage of fairways the player has hit and the percentage of greens reached in regulation are also posted. Because the posting of scores is now almost instantaneous, competitors in contention in tournaments have the dilemma of whether to pay attention to the leaderboards or not. Some elect to focus on their own game and not worry about what other players are doing. Others use the leaderboard to shape decision-making. If a competitor sees the two players ahead of him on the leaderboard have just birdied the 17th hole, he might decide to be more aggressive to make a birdie as well and keep up.